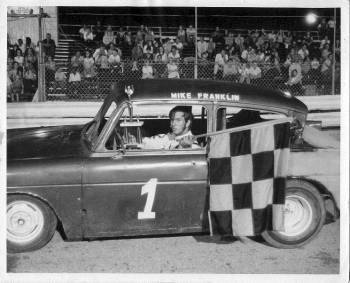 Mike and Ruth Franklin were introduced to racing in an odd way! While awaiting the birth of their first child, they made a trip to the doctor. 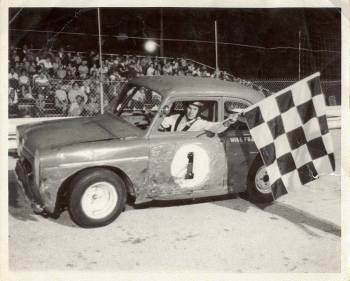 It was none other than Dr. Marshall House, a competitor in the mini stock division at FCS. Soon, the Franklins began attending, and like most good racers, were quickly hooked for life. 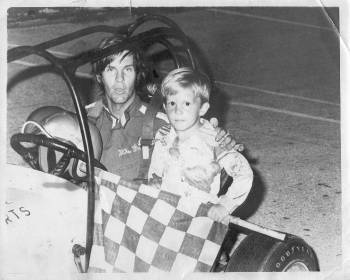 Mike kicked off his racing career in the spring of 1971. 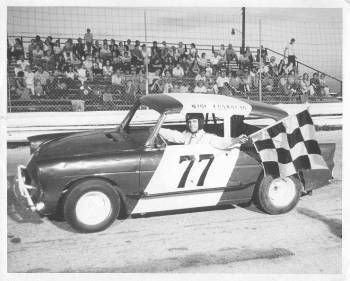 His first start came at Florida City in a flathead Anglia that he built. 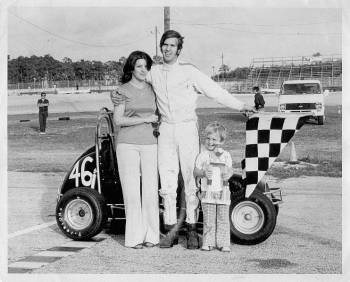 He won the class championship as a rookie, and carried the number "1" when this shot was taken in 1972. This sport has its ups and downs! 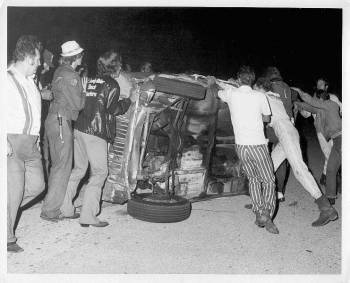 Here Mike's car gets a hand back on its wheels. Assisting in the white fire suit is fellow competitor Gary Greenwood. 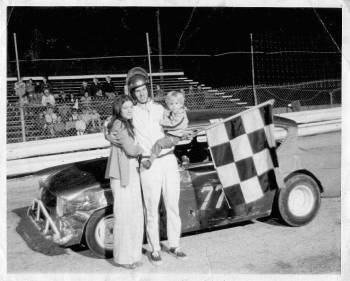 The Franklins remain a strong racing family. Ruth never missed a race, and Mike Jr. has been going since the age of 6 months. 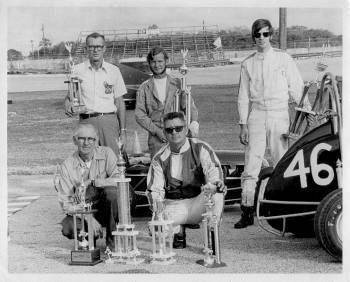 Mike also helped his racing brother-in-law, Ted Merritt. Wierd fact: it may be hard to see, but Mike Jr. is a toddler in the arms of his mom who is seated in the stands. They are in front of the announcer's booth at the extreme left of the picture. I am shown 10 feet away, sitting with my parents. Small tracks are the best! After some new body work and paint, the winning ways continue. Mike repeated as class champion in 1973. Mike Jr. caught the bug at an early age. 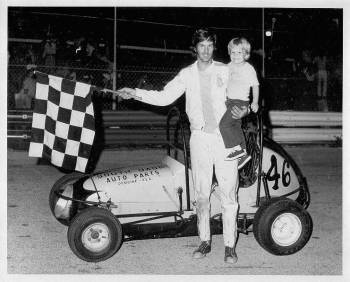 He was a track champion at Hialeah as a teenager, then went on to run, and win, in Late Models. Jr. and Sr. owned and maintained their own equipment as they followed touring series around the south. 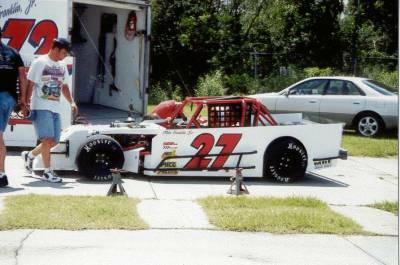 Today, Mike Jr. remains one of the best LM drivers in Florida. He competes where the races are long and the money is high, on both dirt and asphalt. 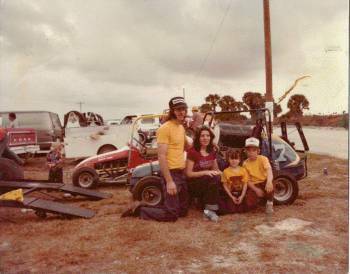 1974 brought a TQ ride in the "Yellow Bird", owned by Oren Fields. Mike was fast right out of the box in this potent TQ. Starter Floyd Smith greets Mike after another win. 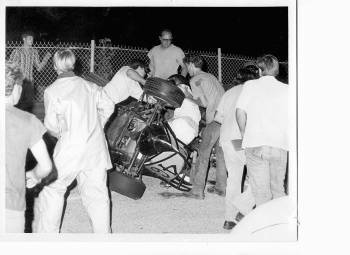 Mike climbs out after a two car flip involving both of the Fields' cars. All you Dads out there, this is how to do it. His rookie year found him runner-up in the SFRA championship. 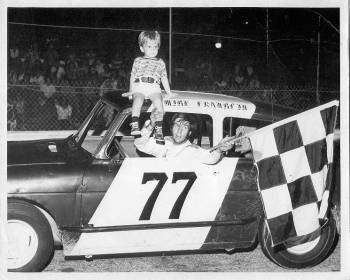 Here is '74 Champ Oren Fields with his car owner, Moore Haven's Claude Hart. 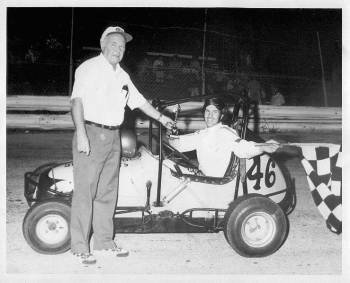 Standing are 3'rd place owner Arnold Fields and driver Warner Graham. After the track closed,Mike built this TQ and is shown at the dirt track in Clewiston. 30 years in the sport! 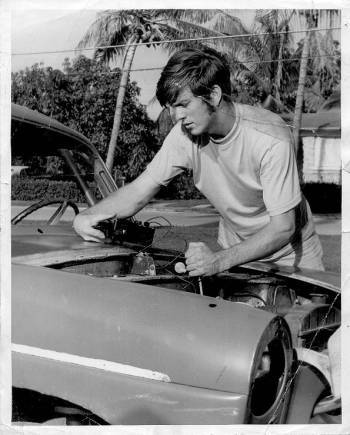 Today Mike still owns Franklin's Auto Repair in Homestead. Now he has returned to the shop as a car builder for the very competitive Outlaw Modified series in Florida. He is back driving these fast cars too.